Gardening can be a hard work if no right tools are used. There are number of gardening tools that must be added to the gardener’s shed. Gardens are beautiful but maintaining a healthy and attractive is a vigorous job. 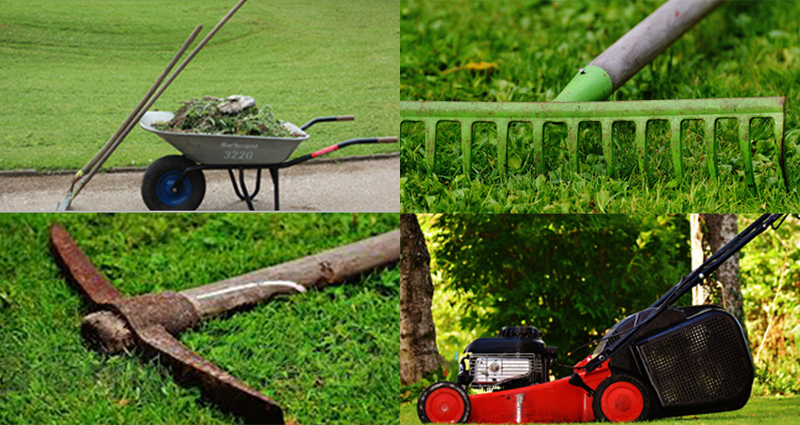 In the infographics we have summed up some of the most common tools and their uses in the garden. Whether an old gardener or new to this it is really important to know the proper use of types of garden tools and to make sure you have a right tool with you. There might be some tools that have versatile uses, garden rake is one of them. garden rakes can be used for turning the soil, to make planting easier. It can be used for collecting the weeds, debris and leaves in the garden area and pond. Shovels can be used for either digging or scooping in the garden, and you need at least one to perform both the tasks. Shovels come all shapes and size, nevertheless shovels not only work in the garden but are compatible even in winters to get rid of the snow. The unwanted branches of plants and bushes can be taken off using a hand pruner. This tool helps you get that perfectly shaped plants by trimming the unwanted branches and deadheads. All of you are aware about the lawn mower, it is the modern age grass cutter which is designed to get you lawn a trimmed and finished looking grass cutting experience. Watering can are really handy and useful in the garden maintenance. Not every plant cannot bear the hose pressure and can be damaged, so, when need to water plants in a targeted manner water cans work wonders. Gardening tools list is incomplete without the utility bucket. Utility bucket is something that holds up all the small gardening tools that sum up your garden maintenance toolkit. We Valiant arborist, as tree surgeon Essex, provide services like garden maintenance, vegetation management, tree surgeon, tree cutting, reports and reduction. If you are looking for gardeners in Essex, then get in touch with us today.